Fascia is the most abundant tissue in your body. It connects and wraps everything in the body in what are known as fascial planes. It is a tough connective tissue with a very important job. Spreading through the body in a 3-D type web arrangement, fascia surrounds everything in your body without interruption from your head to your feet. 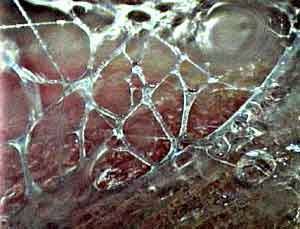 Superficial fascia is located just under the skin and it fuses into a deeper layer of fascia which form speicalized ‘wrappers’ within the body and the second layer of fascia. Fascia that wraps the brain is called meninges (of which there are three: dura mater, arachnoid layer, pia mater). Fascia that wraps the heart is called the paracardium. Pariosteum wraps each bone and pleura wraps each lung. The dura mater, arachnoid layer, pia mater are composed of tissue that is known as the 3rd layer of fascia, or the deepest fascia. Fascia is an intigral part of the body and its systems. It supports and stabilizes the body enhancing its postural support. It is vitally involved in all aspects of motion and it acts as a shock absorber. It aids in circulation, in particular circulation of the venous and lymphatic fluids. This ciruclation allows fluids (and infection) to pass freely along its fascial planes. When infection is flowing though fascia, changes will occur in the tissue and can lead to congestion. Sustained periods of congestion will lead to a more chronic problem within the body, the formation of fibrous and scar tissue. At this point, it is clear why fascia would be a major area of inflammation. In the same way that pathologies can manifest within the body’s fascia, health and vitality can too. Drinking plenty of water and eating food that contains nutrients necessary to sustain life are two crucial ways to positively influence your health. Hydration and nutrients will then pass through your fascial planes and give the body strength and stamina. Another way to counteract the manifestation and flow of infection through your body is to seek out a massage therapist who treats the fascia. Rosewood Holistic Health can help by using Myofascial Release! I will feel for restrictions in the fascial and gently apply pressure into the restricted area. This process is done very slowly because I am feeling and waiting for several things to happen beneath the skin’s surface: first a release of the elastic component of the fascia, second an engaging and release of the very strong collogenous barrier, and third a movement of the skin independently of the muscle upon which it sits. When these three things occur it is called the thixotrophic reponse. Thixotrophy is the ability of certain substance to go from gelatinous to liquid. (Remember what happens to the jello salad left out in the sun at the family reunion?) Occasionally this process will lead to the the finding of a trigger point which will be treated upon tissue release with direct pressure. To avoid splinting, pressure is moderated and applied skillfully as to facilitate a dulling out of referred pain from the trigger point. After treating a trigger point it a crucial stretch of the treated muscle/area realigns and relengthens muscle fibers. Myofascial Release is a highly effective, non-invasive (when done correctly), and wonderful therapy for the layers of our body that we so seldom think about!